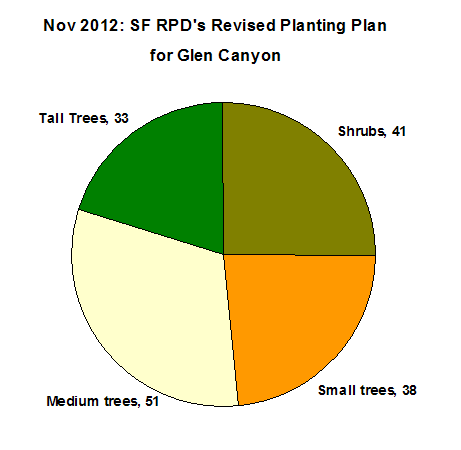 [Edited to Add, March 2013: In response to someone who apparently said we “told lies” and specifically mentioned our allegation that a number of the so-called trees to be planted were actually shrubs, we offer our worksheet that notes the links to the USDA sites that describe the Hollyleaf cherry, toyon, manzanita, and Western redbud as shrubs. Tall trees: 33. The six cottonwoods – the only tall trees on the previous list – are gone, replaced by 33 Coast Redwoods, Douglas Fir, and Incense Cedars. These will grow 80-140 feet high. 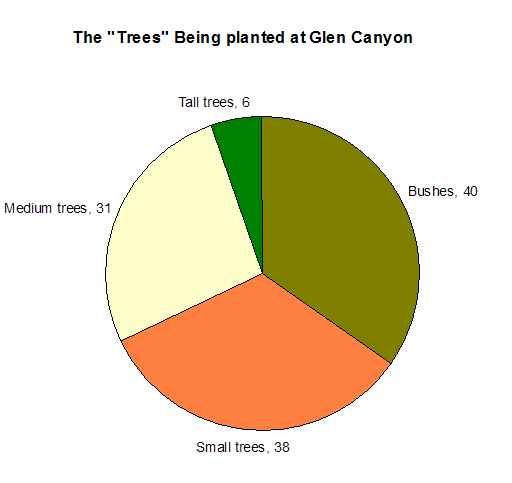 Medium trees: 51. 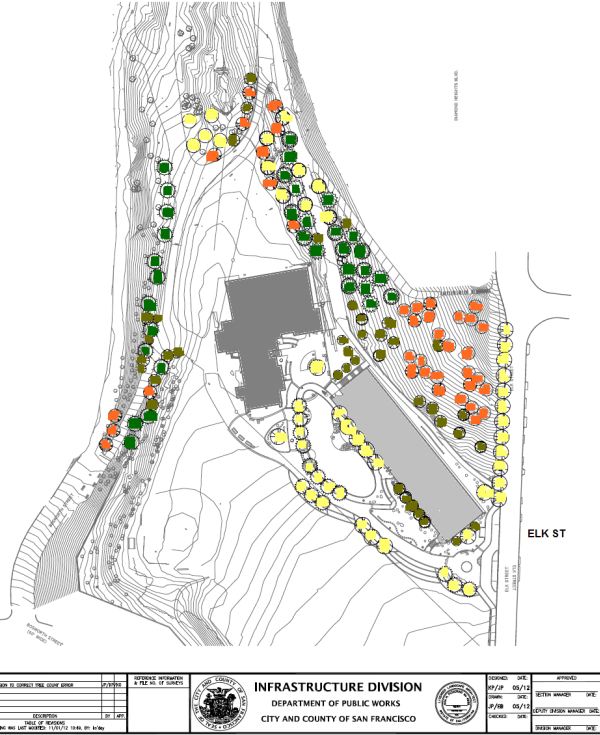 Pacific Dogwood (a medium-sized tree) substitutes Redtwig Dogwood (a bush) in the new plan. It’s rather susceptible to pests, which have wiped it out in many places; we’ll wish these ones a happier fate. Five Red Alders are also new. These trees are about 40-60 feet tall. Small trees: 38. That includes Coast Live Oak, included because it’s very slow-growing so will be a shrub in most of our life-times; and madrone. They’re about 20-30 feet or so. Shrubs: 41 of 163. The flannel bush and gooseberry and redtwig dogwood are gone; instead there’s redbud and toyon and manzanita (not the endangered kind). These are 10-25 feet tall. the brown are the shrubs. Getting rid of buckeye from the list is good, they’re toxic to bees and the Canyon has two natural hives. [Edited to Add: One was wiped out during the tree-felling.] But we think people with pollen allergies should be aware that Coast Live Oak is a severe allergen, and Red Alder a moderate one. Incense cedars may cause an allergic reaction in people sensitive to cedar pollen (cedars generally are allergenic). This entry was posted in General and tagged Bushes and shrubs, environment, San Francisco Recreations and Parks Department, Trees. Bookmark the permalink. First, thanks to whoever provided this concise, exceedingly clear description and colored map! Bravo! Having lived in Austin, TX for many years, which is populated by live oaks, I can share that many people over time developed “oak fever'”,which is not a fever at all but allergy to oak pollen. It seemed to develop after a couple of years of exposure to seasonal pollen and was miserable for those who developed it.